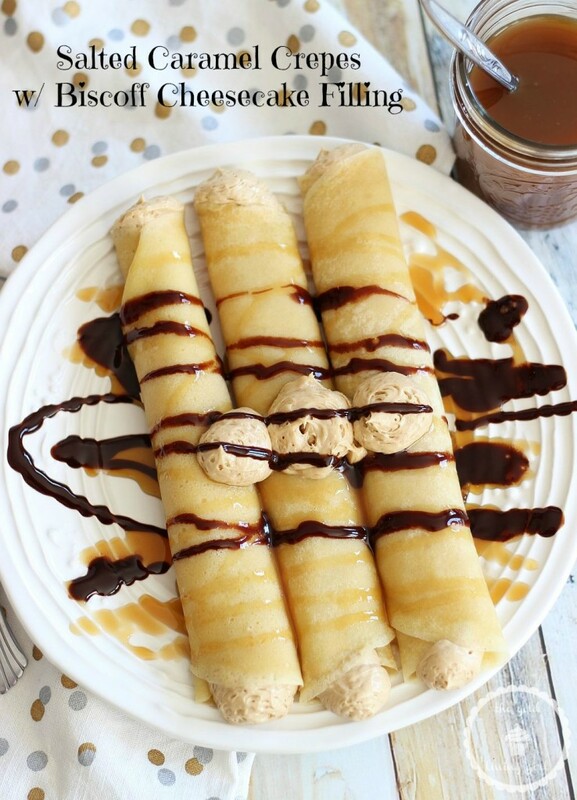 Crepes infused with Bailey’s Salted Caramel liqueur, filled with an easy no-bake Biscoff cheesecake, and topped with a drizzle of caramel sauce! Picking up where we left off…. crepe week got delayed by some busy life stuff this week, but it’s back! Let’s get to it. I am an “out of sight, out of mind” person. If I don’t have junk food in the house, I won’t think about it, crave it, or eat it. That’s basically never the case though because there’s always something sweet or ‘unhealthy’ lurking in the house. It’s even true when I’m baking. I forget about 3/4 of what I have in my pantry, and if I can’t see what my options are, I don’t remember that I even have them on hand. For example, cookie butter. I forgot that I had not 1, but 2 jars of cookie butter. I can’t see it in the pantry layered behind 85 jars of peanut butter, so I forgot all about it. Caramel sauce. That was also lost somewhere in the pantry. No clue it even existed in my home. So… my solution is that I started to put things that I know I want to use in a recipe soon right on the kitchen counter. Then I see it, and remember it, and use it. Problem solved. Not so fast. As you might guess, this had a significant snowball effect. Half of the contents of my pantry now sit on the kitchen counter at all times. This is not ideal. Slowly but surely, I’ve moved about 25 items from the pantry onto the counter. Including, but not limited to, Cinnamon Toast Crunch cereal, Twix bars, Butterfingers, candy hearts, Strawberry 3 Musketeers, candy canes (why??? Like I will be baking with those soon? A Christmas remnant lingers…), salted peanuts, cherry baking chips (they’re a thing! ), strawberry marshmallow fluff, Reese’s pieces, Bailey’s liqueur, pretzels, Nutella, white chocolate chips (as though I would ‘forget’ about them), pastel sprinkles, oatmeal cookies, and Red Velvet Oreos (YESSSSSSS!!! They do exist!). Hopefully, all of those items don’t end up in one recipe together. It could be the most amazing thing ever, or totally gross. My guess is the latter. On the plus side, it has genuinely helped me to put together a few different recipes lately since I can really see what I have on hand. I mean, I hate to empty the contents of my pantry all over the kitchen, but it IS effective! 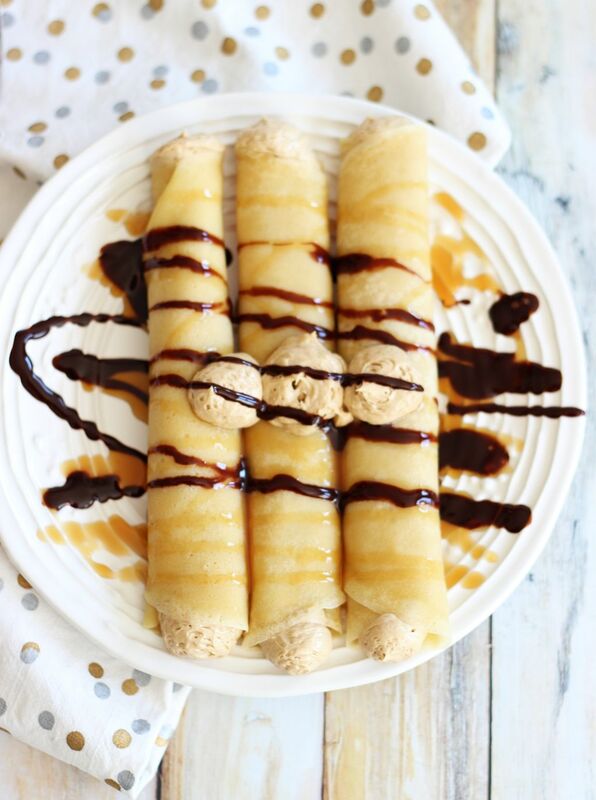 However else would we learn about these Salted Caramel Crepes with Biscoff Cheesecake Filling and Caramel Sauce!!! This was a product of my gutted pantry! I saw the jars of caramel sauce and Biscoff and decided they just *had* to be a match made in heaven. Rejoice! They are! I added Bailey’s Salted Caramel liqueur (it’s delish!) 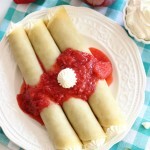 to the crepe batter, and the effect of that special liqueur on the flavor of the crepes is unmatched. 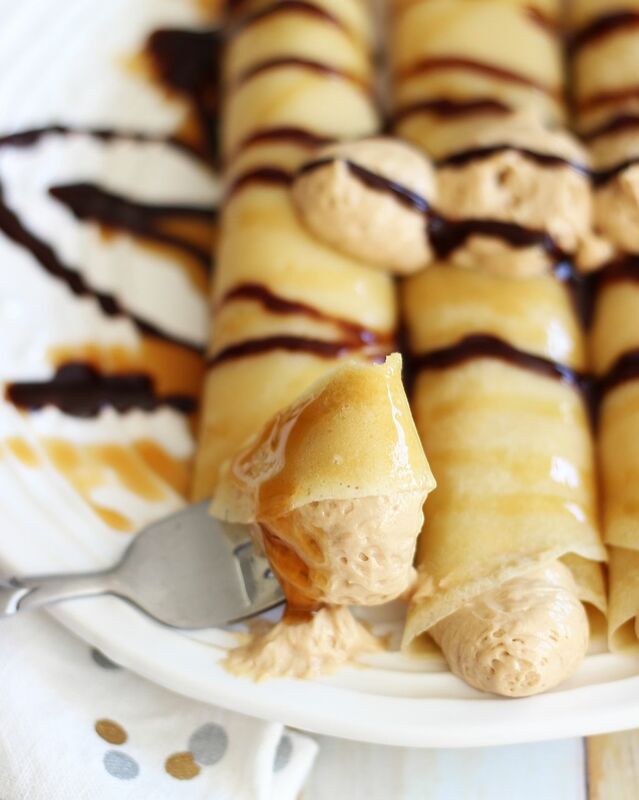 You will only want to eat these crepes for the rest of your life. 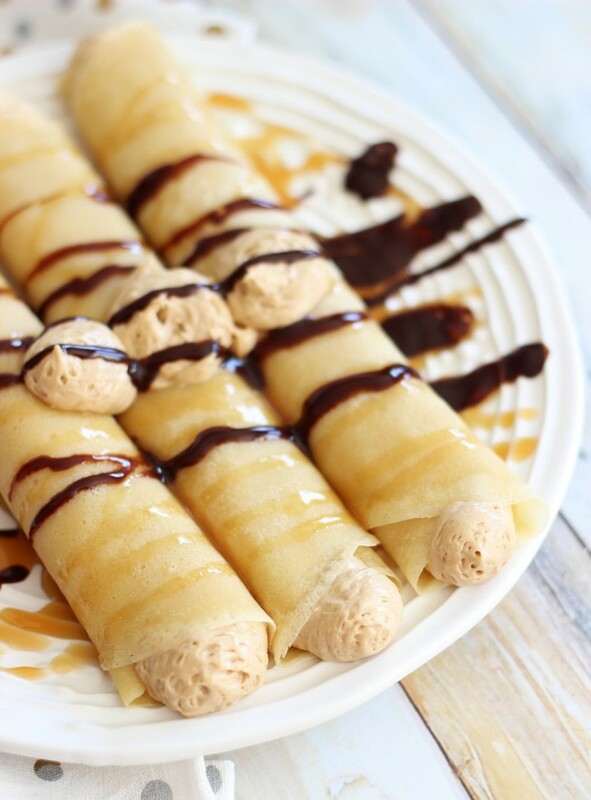 Even if it’s not Bailey’s Salted Caramel, I’ve decided that ALL crepes should have liqueur in them, always. It’s non-negotiable now. The filling is a super simple no-bake cheesecake filling made from Biscoff, cream cheese, and whipped topping – to make it light and fluffy! 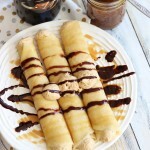 Drizzle with a little caramel sauce, and a drizzle of chocolate syrup for good measure. Heaven on a plate! And best of all, it’s dessert for breakfast! 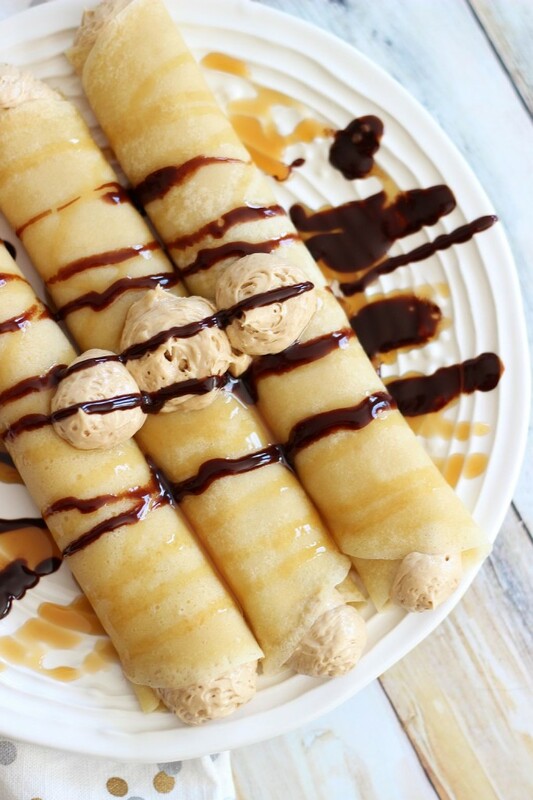 Crepes infused with Bailey's Salted Caramel liqueur, filled with an easy no-bake Biscoff cheesecake, and topped with a drizzle of caramel sauce! In a large mixing bowl, combine Biscoff and cream cheese. Beat until well-combined. 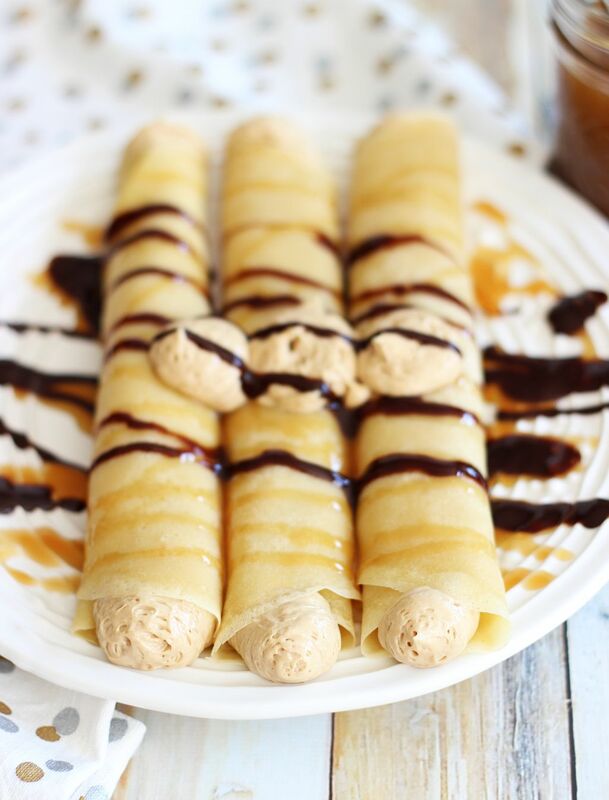 Spoon or pipe about 1/3 c. Biscoff cheesecake filling across the diameter of each crepe, and then roll them into 1-inch tubes. Drizzle with caramel sauce and chocolate sauce. Enjoy! Awww, thank you!!! 🙂 So glad you like them! 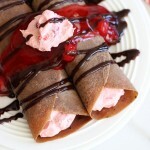 I think these might just be my favorite crepes yet, Sarah! I am SO addicted to cookie butter, so these are just calling my name. And I love the touch of salted caramel. Beautiful presentation and amazing dish, friend! Holy heck…everything about these sounds absolutely amazing! We are crepe fans at our house, but haven’t gone the Biscoff route before. That clearly needs to change. I am so glad I am not alone (but with to-dos). If I don’t leave out the things I need to take care of and if I don’t coat my desk with stickies and to-do lists I will totally forget and never do anything. Its terrible! But I am thrilled I am not alone. 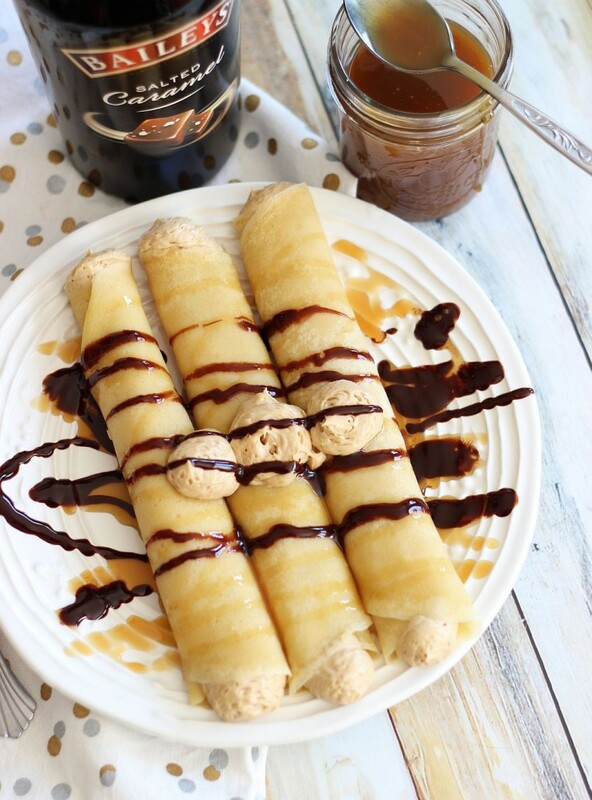 These crepes look TO-DIE-FOR and also, I never knew Bailey’s made Salted Caramel Liqueur so thank you! 🙂 I must head to the store and get some!!! I can’t even handle all the goodness on that plate of food – these look absolutely amazing!! Pinning! Yay! So glad you like it! Thanks, Cate! OH. MY. These are perfection. That biscoff cheesecake filling?!? Totally dying over these! These are absolutely going on my weekend menu. Love! oh my god…salted caramel and biscoff..I don’t even need to read anything else! I want these right NOW! Lol!!! Thank you so much!! It’s really quite good! They have a bunch of special flavors out now! 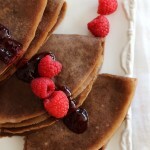 These crepes are beautiful, too! Love Baileys! And the cheesecake filling- awesome! 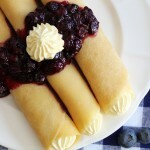 I found this on Mix It Up Monday and wanted to stop by to say these crepes look divine! I don’t even know what biscoff is and my mouth is watering…..lol! An Aussie here, so I’m off to do my research. I MUST have some….Yummmm. Sarah, these crepes are to die for! I love sweet breakfasts like this 🙂 Thanks so much for sharing on The Makers! I’m in love with the Biscoff butter. I imagine these crepes are amazing! Thanks for sharing at the This Is How We Roll Link Party on Organized 31. The salted caramel in the batter sounds amazing! Thank you so much, Audrey!! 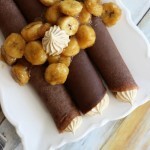 Another crepe recipe winner! Drooling over these. Thanks for linking up at Best of the Weekend! Pinning these! These look amazing! While I must admit you drew me in with the salted caramel headline, the biscoff cheesecake filling looks like a winner too. I think I’m off to make some crepes now since I have everything in my pantry. Thanks for the recipe! Pinning. Everything about this sounds amazing! Caramel! Cream Cheese! These look delicious. Thanks for sharing. Seriously fabulous dessert! Awesome photographs too! Well done! Thanks so much for sharing on Show Me Saturday! I can’t wait to see what awesomeness you bring to this weekend’s linky party! I’m not familiar with the Biscoff butter ! What is it and where do I find it ? Hey there!! Are you familiar with cookie butter? Speculoos? It’s a spread made from cinnamon cookie crumbs. I know it sounds weird, but it’s really delicious. Have you ever flown Delta and gotten those Biscoff cookies? Biscoff makes those into a ‘spread’ too. I find it at Publix, Walmart, Target, and Trader Joe’s has their own brand called Speculoos! Most grocery stores carry something like it. I hope that helps!